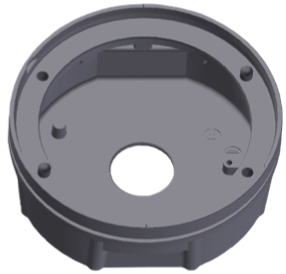 The shallow base consists of a treated aluminium casting with a hole in the bottom suitable for conduit connection. The base is equipped with an internal grounding screw with yellow-green cable lead, size 2.5 mm2, 0.250 m long, with female faston terminal for quick connection to the corresponding of the fixture. An additional external grounding screw is provided close to the cable entry. The shallow base is designed for cementing in place by means of epoxy-resin in a hole drilled in the pavement. A gasket (separately supplied) must be placed between base and fixture for water tightness placed in the relevant shallow base groove (only for 12” dia.). On request, shallow bases might have one or two cable leads with receptacle incoming inside the base through one or two cable glands. Hardware for fixing, screw and washer, are in stainless steel. Special tools are available for easy and precise installation. All bases are manufactured with the highest quality material and equipment. On request, customized version are available.h transformer location for the ends of the series cable sections. The circuits may be readily disconnected for testing or for replacing faulty equipment and then quickly rejoined for continued use.